The nearest railway stations are Llandrindod Wells and Caersws which are both serviced by Arriva trains from Birmingham (via Shrewsbury). Details of timetables and tickets are available from National Rail Enquiries. Please be aware that you will need to arrange onward travel from the station to and from the venue. 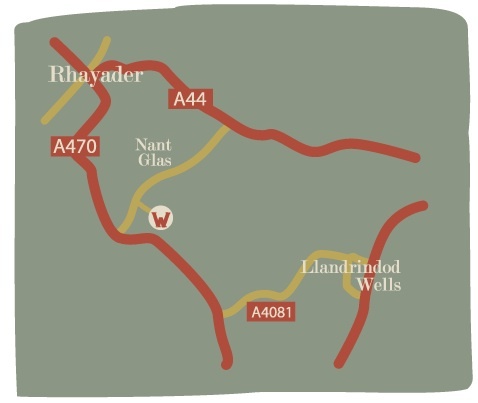 The nearest bus stop is Argoed Mill (15 minutes walk away) on the A470 serviced by the X47 bus between Llandrindod Wells and Llanidloes. For the latest bus information, try the journey planner on Powys County Council’s public transport page. Alternatively, you can contact Traveline Cymru on 0871 200 22 33 (National Rate, 10p/min) or visit their website. The Willow Globe is four miles south of Rhayader off the A470. Take the turning to Nant Glas; the farm track to the theatre is 200 yards up the lane on the right. On performance days there is a sign alongside the A470. Parking is available on site.